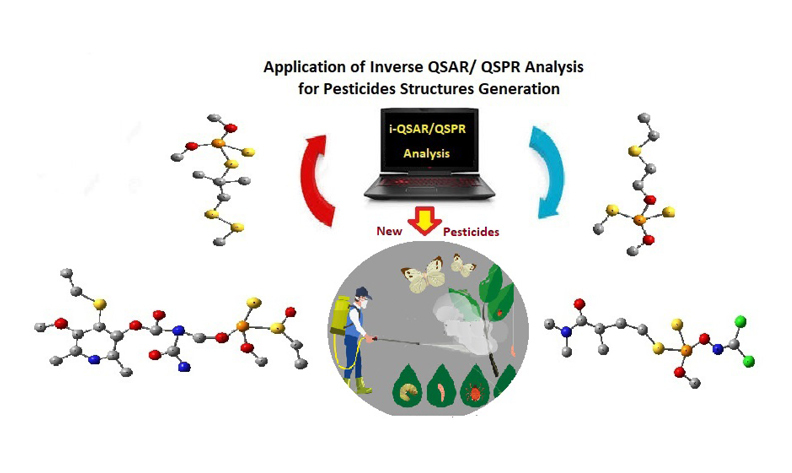 The present work has focused on the application of the inverse-QSAR/QSPR problem for generating new structures of pesticides; this is in view of its extremely important and widespread use in several areas, particularly the agricultural field. For this reason, we implemented a methodology containing nine detailed successive steps that include a quantitative structure–activity/property relationship (QSAR/QSPR) study performed to develop a model that relates the structures of 190 pesticides compounds to their n-octanol–water partition coefficients (logkow). We used the unique atomic signatures which represent the structures and acts as independent variables while the property (logkow) as the dependent variable. The model was constructed using 130 molecules as training set, and predictive ability tested using 60 compounds. Modeling of logkow of these compounds as a function of the signatures descriptors was established by multiple linear regression (MLR) using (LOO) cross-validation. As a result, a QSAR/QSPR equation with 14 atomic signatures was hereby obtained with a R2 =0.659273, Q2 =0.65617 and RMSEtraining= 0.930192, s=1.37297 for the training set and in leave-one-out (LOO) cross-validation experiment set value, q2 =0.605676, RMSELOO= 1.0936 respectively. In addition to all of the above, new structures have been generated for a range of pesticides that can be included as future search topics. Atomic Signatures; I-QSPR algorithm; Multiple linear regression (MLR); n-Octanol–water partition coefficients; Pesticides.